A quotation probably more famous than the man who first said it, English poet Alexander Pope. You may well have not heard of him, but you have probably heard his words. Screwing up (to err, in other words) is human indeed. We are all flawed human beings. In relationships, mistakes – the biggies and the not-so-biggies – happen. They often lead to disagreement, strife, sorrow, or a sense of betrayal. Forgiveness is human too, despite what Mr. Pope had to say. Though you may think of God as the final dispenser of forgiveness, you and I have the power to forgive as well. Doing so can help us avoid bitterness and resentment and often will salvage a relationship. To forgive does NOT mean that you condone wrongdoing. Reaching a place of true forgiveness is NOT about you deciding that what someone did is okay if it was not. .
Forgiving does NOT mean you have to forget (is that even possible?). . What forgiveness IS: eliminating the negativity that results from hurt by letting go of emotional baggage. . Though it can feel very comforting or powerfully releasing to be forgiven, make no mistake: we do not forgive for the other person; we forgive for ourselves! Forgiveness is for our own growth and happiness. When we hold on to hurt, pain, resentment, and anger it harms us far more than it harms the offender. .
Forgiveness frees us to live in the present. Reliving the wrong that was done to us keeps us living in the past and missing today’s beauty. .
Forgiveness allows us to move on without anger or contempt or seeking revenge. As Confucius said about revenge, “Before you embark on a journey of revenge, dig two graves.” This applies as much to the spirit of anger behind the desire for revenge as much as to revenge itself. Even if you do not actively seek revenge, holding on to your anger brings you down. .
Forgiveness lets us regain our personal power. Our anger, regret, hatred, or resentment towards someone means that we are giving up our power to that person. Envision a chain around your neck, held by the one who wronged you. Until you can forgive, you won’t break that chain and the person will still have an unhealthy hold on you. .
Forgiveness brings you back to good physical and mental health. The systems of the body respond to negative emotions, affecting the immune system in ways that would blow your mind. Releasing those emotions is a good idea. .
Forgiveness clears the cobwebs so that you can see the good again. 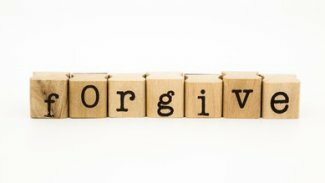 When you forgive you will be able to see all the positive qualities in the person who hurt you—qualities that you loved once—and allows you to accept him or her fully, warts and all, and have a chance at a long-lasting, healthy relationship. . When the pain of holding on to the wrongdoing in the past continues to follow you into the future, you have a choice. Be bitter or let it go. If you are in a current relationship that you want to heal and continue, a serious and loving discussion is in order. Take your time to process your anger and hurt. . Wait until you are reasonably sure that your partner will not repeat the hurtful or treacherous act (i.e. he or she regrets the wrongdoing, sincerely desires to make restitution, and confidently vows not to repeat the mistake). Ask questions that you need answered. This is a moment for full disclosure – your partner’s. You have a right to know whatever it is you want to know. Explain that you are choosing to forgive.. If the hurt took place in a past relationship and you can’t seem to get out from under the anger, resentment, or heartache that it caused, then your process will be an internal one. You can talk to a close friend or therapist to speak your forgiveness, or write it out in a journal. Be sure you understand your feelings and express them. . Put yourself in the other person’s shoes. As difficult as this may be, trying to understand why he or she harmed you and your relationship is very important. (Understanding does not mean condoning, but is a step to forgiving). Forgive yourself for your contribution to what happened. Find the beauty in your present life. Forgiveness is not reserved for our romantic partners. We can all find renewed richness in our relationships if we can learn to forgive. Many people find their bonds to estranged parents or siblings are renewed and strengthened. Discord with a neighbor or co-worker can be healed. Alexander Pope had the right idea after all. The healing and peace that can come from forgiveness may indeed seem heaven-sent. Appeal to your own higher – or divine – nature and see if you can forgive, and move on.